The album Liane Halton and I have been working on — a journey that began nine months ago with our first collaboration at DDC — is done. 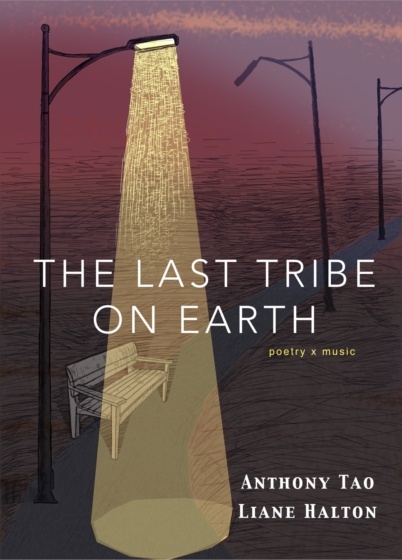 Behold, The Last Tribe on Earth, a nine-track, 40-minute album that combines my original poetry with her original compositions on the classical guitar. It has to be heard to be… believed? Or enjoyed. Or for this to make sense, maybe. 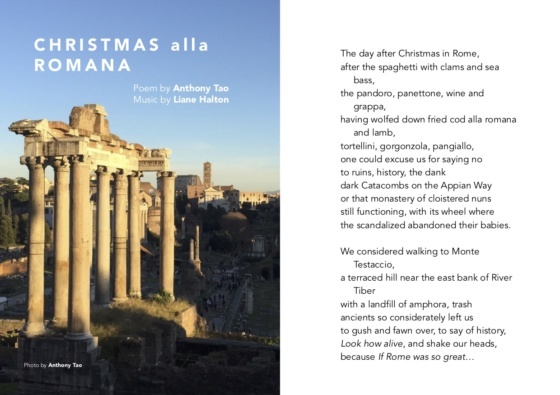 It also comes with a 60-page PDF of a booklet featuring all the poems, plus photography by Aaron Berkovich. The cover art (above) is by Katie Morton. 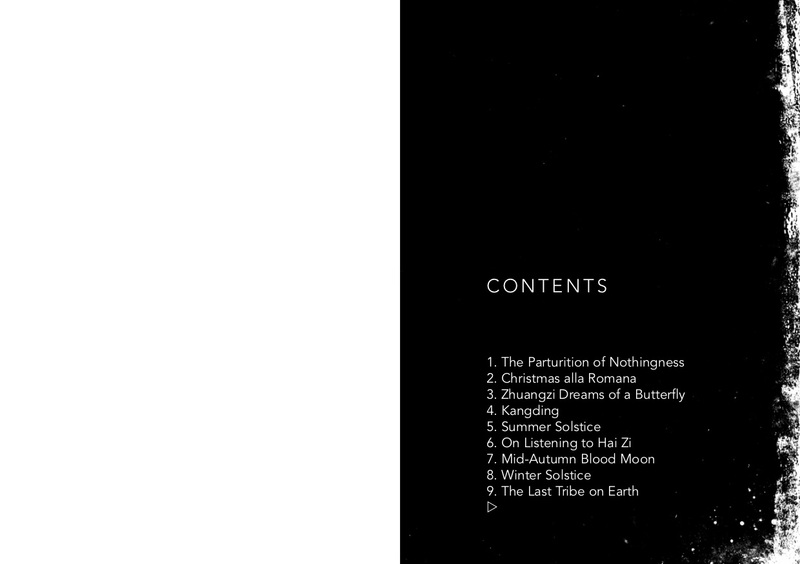 This is the product, in actuality: a 60-page chapbook with free download codes for the music on the inside backcover. Those books arrived on Wednesday! If you’re in China, get in touch with me to order one (only 60 RMB). Because we’ve put a lot of thought into it, and a lot of work in executing those thoughts. On the technical side, that means painstakingly matching words, even syllables, to notes, or building musical phrases around sections, or trying to say different words differently — but without singing, because then this would become something else, and without relying on rhymes, because then this would become something else. We don’t want anything less than what poetry demands. On the thematic side, we’re talking about joy, sadness, longing, bliss, regret, truth, purpose, something approximating truth, some delusion of purpose, some allotment of suffering proportional to our mistakes, some allocation of pain for being human — it’s all in there, just like so much of us is in there. Change, loss, hope, endurance, the imperfection foisted upon us as humans, the illusion of perfection, the possibility of what may be. There is uncertainty here. There is a bit of experimentation. I want to say part of what makes this exciting is that I don’t know how it will be received, and there’s no way for me to know — until you tell me. I want to admit my delusions, come clean about how expectations are managed; I also want to say that maybe because no one knows, we’re in this journey together and it’s the unknown that makes it fun. Alas, that’s a cop out. A lesser promoter might add, “You’ll only know if you try.” I prefer to leave that unsaid. But this is the one thing I’m counting on, as a matter of faith: it’s possible, with so many unknowns, that people will end up liking it without being able to say why. What need is there to rationalize? Take the leap and give it a chance. 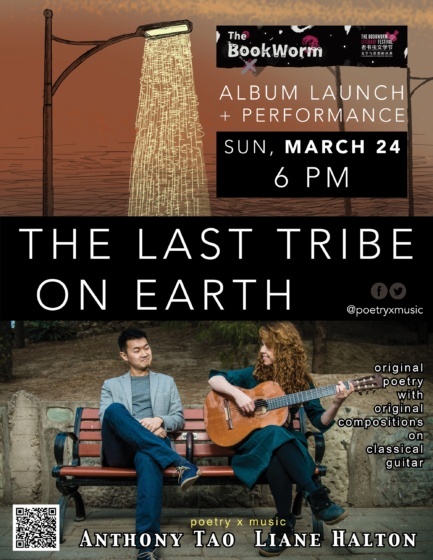 On Sunday, March 24 at 6 pm, Liane and I will be performing the full album on the Bookworm Literary Festival stage. This will be our first time playing through all the tracks, as well as a celebration. 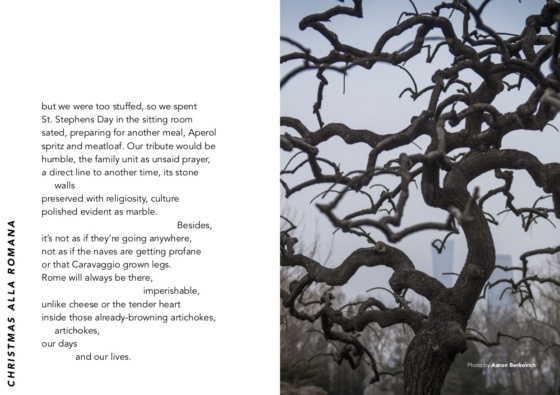 Come share this moment with us, if you’re in Beijing! Click on the poster below for more info. Daniel Rothwell interviewed us as only he can, and then remixed one of our tracks using just a recording from our rehearsal. The result is pretty amazing. Also, we have him to thank for the GIFs. Follow us on Twitter and Facebook if you’d like. We’ll be posting some tracks onto YouTube as well in the coming days. Here, again, is the album. Thanks for your support. If you’d like to review the album or write about any of our future shows, please get in touch.